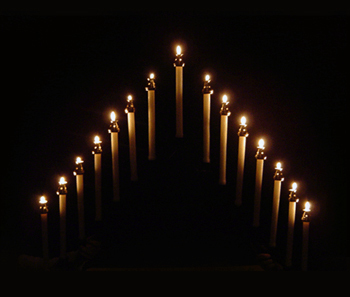 On this and the two following days, the Church anticipates the Night-Office; she celebrates it on the previous evening of each day, and this in order that the Faithful may be present at it. 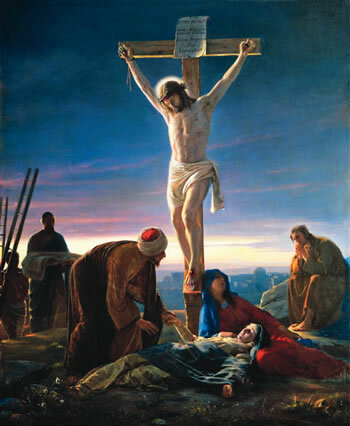 The Matins and Lauds of Maundy Thursday are, therefore, said this afternoon. The Faithful should make every effort to assist at this solemn Office, seeing it is on their account that the Church has changed her usual hours. As to the merit there is in joining in it, there can be no doubt, but that it is to be preferred to any private devotions. The surest means for obtaining favours from God, and winning him to our requests, is to approach him through the Church. And as regards the feelings of devotion wherewith we ought to celebrate the mysteries of these three great Days, the Offices of the Church are, ordinarily speaking, a surer and richer source than the Exercises of Piety composed by men. The soul that feeds on the words and ceremonies of the holy Liturgy, will be all the more disposed to profit by the private devotions she practises at home. The prayer of the Church will thus become the basis, whereon is built the edifice of christian piety during these glorious Anniversaries of our Redemption; and we shall be imitating our forefathers who lived in the Ages of Faith, and who were such admirable Christians, because they lived the life of the Church, by means of the sacred Liturgy. The Office of Tenebrae for to-day is given below, on Maundy Thursday; the " Night Office". The Chief Priests and the Ancients of the people, are met to-day, in one of the rooms adjoining the Temple, for the purpose of deliberating on the best means of putting Jesus to death. Several plans are discussed. Would it be prudent to lay hands upon him at this season of the Feast of the Pasch, when the City is filled with strangers, who have received a favourable impression of Jesus from the solemn ovation given to him three days back? Then, too, are there not a great number of the inhabitants of Jerusalem, who took part in that triumph, and whose enthusiastic admiration of Jesus might excite them to rise up in his defence? These considerations persuade them not to have recourse to any violent measure, at least for the present, as a sedition among the people might be the consequence, and its promoters, even were they to escape being ill-treated by the people, would be brought before the tribunal of the Roman Governor, Pontius Pilate. They, therefore, come to the resolution of letting the Feast pass quietly over, before apprehending Jesus. But these blood-thirsty men are making all these calculations as though they were the masters. They are, if they will, shrewd assassins, who put off their murder to a more convenient day: but the Divine decrees, - which, from all eternity, have prepared a Sacrifice for the world's salvation, — have fixed "ttiAa very year's Pasch as the day of the Sacrifice, and, to-morrow evening, the holy City will re-echo with the trumpets, which proclaim the opening of the Feast. 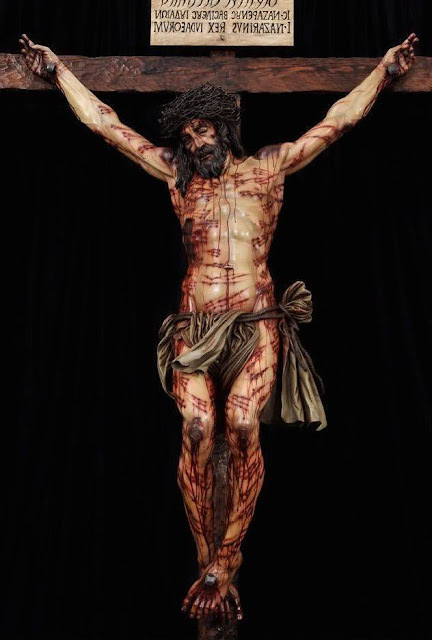 The figurative Lamb is now to make way for the true one; the Pasch of this year will substitute the reality for the type; and Jesus' Blood, shed by the hands of wicked priests, is soon to flow simultaneously with that of victims, which have only been hitherto acceptable to God, because they prefigured the Sacrifice of Calvary. The Jewish priesthood is about to be its own executioner, by immolating Him, whose Blood is to abrogate the Ancient Alliance, and perpetuate the New one. But how are Jesus' enemies to get possession of their divine Victim, so as to avoid a disturbance in the City? There is only one plan that could succeed, and they have not thought of it: it is treachery. 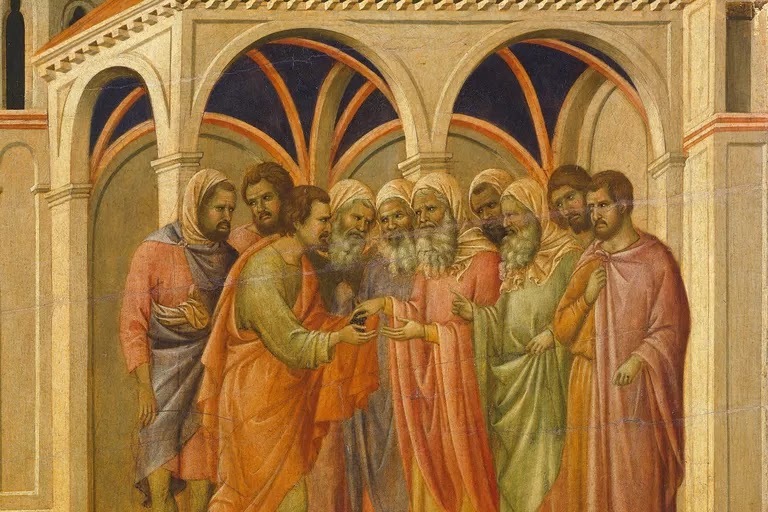 Just at the close of their deliberations, they are told that one of Jesus' Disciples seeks admission. They admit him, and he says to them: What will you give me, and I will deliver him unto you?^ They are delighted at this proposition: and yet, how is it, that they, doctors of the law, forget that this infamous bargain between themselves and Judas has all been foretold by David, in the 108th Psalm? They know the Scriptures from beginning to end; — how comes it, that they forget the words of the Prophet, who even mentions the sum of thirty pieces of silver.^ Judas asks them what they will give him; and they give him thirty pieces of silver! All is arranged: to-morrow, Jesus will be in Jerusalem, eating the Pasch with his Disciples. In the evening, he will go, as usual, to the Garden on Mount Olivet. But how shall they, who are sent to seize him, be able to dis- tinguish him from his Disciples? Judas will lead the way; he will show them which is Jesus, by going up to him and kissing him! ^ 8t Matth. xxvi. 15. • Icfem, xxvii. 9. Zach. xi. 12. On this day, in the Roman Church, was held the sixth Scrutiny, for the admission of Catechumens to Baptism. Those, upon whom there had been previous doubts, were now added to the number of the chosen ones, if they were found worthy. There were two Lessons read in the Mass, as on the day of the great Scrutiny, the Wednesday of the fourth Week of Lent. As usual, the Catechumens left the Church, after the Gospel; but, as soon as the Holy Sacrifice was over, they were brought back by the Door- Keeper, and one of the Priests addressed them in these words: " On Saturday next, the Eve of Easter, " at avAih an hour, you will assemble in the Lateran "Basilica, for the seventh Scrutiny; you will then " recite the Symbol, which you must have learned; "and lastly, you will receive, by God's help, the " sacred laver of regeneration. Prepare yourselves, "zealously and humbly, by persevering fasts and " prayers, in order that, having been buried, by this " holy Baptism, together with Jesus Christ, you may " rise again with him, unto life everlasting. Amen." At Rome, the Station for to-day is in the Basilica of Saint Mary Major. Lot us compassionate with our Holy Mother, whose Heart is filled with poignant grief at the foresight of the Sacrifice, which is preparing. From Dom Prosper Gueranger's commentary on Spy Wednesday in The Liturgical Year.